An early intervention unit for 50 underage children (0 to 6 years old) with physical and/or mental disability, or with Pervasive Developmental Disorders/autism. This unit will have classrooms with adapted sanitary accommodations, a space for common activities (celebrations, animations), and other rooms for meals, naps, workshops, playgrounds and for rehabilitation (occupational therapy, physical therapy, specialized education...). The rooms will be spacious enough to welcome every child, with or without a wheelchair. A specialised school/education center for 40 children and youth with autism with or without any physical disorder associated with autism. This unit will have rooms specifically designed for various types of therapies (e.g. psychomotor therapy, speech therapy, TED therapy, specialized education and other therapies), classrooms, a playground, a dining area, and different workshops (handicrafts, painting, photography, computer, music, body language). A pioneer living space to welcome 15 youth with autism over the age of 14, with or without any physical disorder associated with autism, in the afternoons and/or during the night. This space would reflect a real home environment where the youth with autism will share living spaces; such as dining room, TV room, and other common areas, while each one will have his/her own bedroom with bathroom: This way, we will create a family like structure, with emphasis on human interactions, that will be different from the schools and the center of support and socialization (dedicated to learning and maintenance of skills). By providing a distinction in their activities, youth with autism will develop a better understanding of their spatial environment. A daytime center for support and socialization welcoming 30 young adults, over the age of 20 and who have severe autism. This centre will include several workshops (handicrafts, painting, computer, music, body language), classrooms (to maintain and develop acquired skills), as well as a dining area. A hydrotherapy unit for children with autism which will also be used by around 200 children and youth with disabilities at SESOBEL. this hydrotherapy unit opened its door and is operating since September 2017. The construction of this pool was done under the direct oversight of its sole donator. A reception area to welcome the children and their families. Two underground parkings will also be included for the families who visit the center and the staff members. - 100 outpatient children and youth will benefit from around 1665 therapy sessions. The building will also include rest areas and meeting rooms for the educational teams, as well as offices for the director of pedagogic programs and for the social workers. A specialized hydrotherapy unit was donated “in loving concern for all children”. This Hydrotherapy unit was inaugurated in September 2017. Please watch this video to discover the uniqueness of this hydrotherapy unit! Children with autism, motor, and / or intellectual disability have sensory-motor impairments that block their development. The aquatic environment provides them with relaxation & security . As the body is lighter in the water, the movements are increased. On the other hand, in the water the movement undergoes resistance which improves strength, energy and endurance. Children are motivated while having fun. 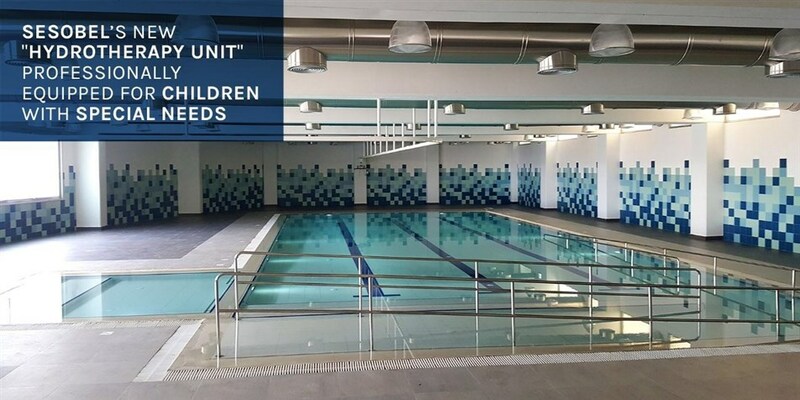 In addition to its importance for SESOBEL's children and youth, this hydrotherapy unit is open to the public in the afternoons as a source of self-financing for people with neurological diseases, rheumatological diseases and orthopedic diseases. We plan to construct and furnish the building in a manner that ensures maximum security. For example, the floors will be in linoleum to provide cushioning in case of a fall, the baseboards and doors will have rounded edges, radiators will have covers, and windows will be placed high enough to prevent accidents. The comfort and well-being of our children are always of utmost importance. Therefore, large windows will be used to maximize the natural light, various spaces will be painted in different colors for easy identification inside the center, sound barriers and acoustic isolation will be installed to enhance a quiet and calm environment necessary for the concentration during the learning and rehabilitation sessions. The design and layout plans for each space will be conceived, taking into consideration important elements for accommodating people with limited mobility, such as: open space, wide corridors, elevators, ramps (maximum gradient of 6%) with hand rails. Additionally, the design of the walls and the openings will be studied in order to facilitate the necessary surveillance of the center and the outdoor spaces. - The center, situated on a hillside, will be built in such a way to integrate and respect the local architecture. Terraces, gardens, and courtyards are planned for every floor to allow the children and youth an easy access outdoor and benefit from the open air and greenery. - Energy saving structures are planned: the exterior masonry will include a double wall (10 cm x 2) with a 5 cm-space between the two walls. A waterproof membrane will be placed on the basement walls, the ground-level walls, the floor of the inside garden, and the roof. Double-glazed windows and doors will also guarantee a good thermal and noise insulation. The installation of solar panels and solar water heaters are also planned. - An earthquake-resistant structural design is foreseen to provide a stable and durable building that will last for decades to come. - The living space and center of support and socialization will fill in the void resulting from the absence of such specialized structures for youngsters with autism in the country. This living space is, therefore, unique in Lebanon and new to the Middle East. The youngsters with autism will learn to live independently and autonomously, away from their home setting. - The spacious classrooms, workshops, treatment and rehabilitation rooms, game room, living rooms, will allow special integration of functionalities unseen in other school settings. - The architecture of the building will offer sustainable construction features. This is unheard of in Lebanon when it comes to serving the needs of children and youth with disability. - Risk analysis and corrective measures: Due to the nature of the ground of the construction site, it will be necessary to use specialised construction techniques, tools and machinery. The cost for such equipment and machinery has already been included in the budget estimate. Furthermore, potential increases in the cost of some raw materials are taken into account. - Fundraising: A special team will regularly do a study for new and prospective sources of funding, both private and public. Additionally, SESOBEL will organize several fundraising events. Donors may contribute to the construction of specific units in the center that will carry their name. (Please check the remaining units to be sponsored on this pdf link here). A Project Management Committee (PMC), comprised of the President/General Manager of SESOBEL, Mrs. Fadia Safi, and three members of the Board of Directors, Mrs. Frida Chammas, Mr. Labib Akiki and Mr. Sélim Khoury, is responsible for the overall execution of the project with the help of the architect and the site manager. The duration of the construction of the center was estimated between 24 and 30 months . We would also like to share with you the professionals and renowned companies that Sesobel has teamed-up with for the execution of this important project. Additional details and information can be provided upon request.